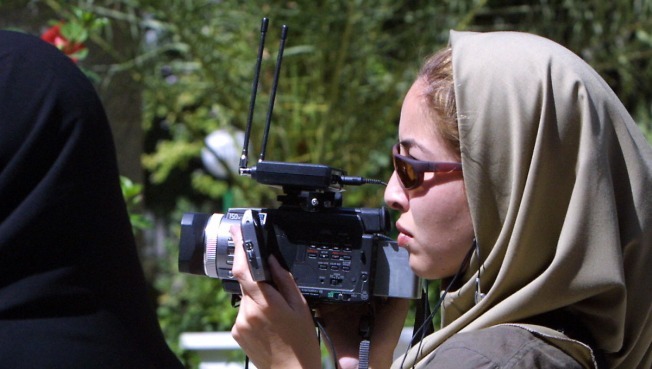 US-Iranian journalist Roxana Saberi takes footage in Tehran on Septmber 17, 2003. The freelance journalist has been arrested in Iran and has had no contact with her family since early February. A U.S. journalist and former beauty queen was arrested in Iran a month ago for buying a bottle of wine and has not been heard from since, her father said Sunday. Roxana Saberi, 31, has not been heard from since her last call on Feb. 10, her father, Reza, told The Associated Press on Sunday. "We haven't heard anything," he said. The family decided to go public, he said, "because we wanted to get some information." Officials in Iran have not publicly confirmed the arrest. A duty officer at the U.S. State Department said Sunday officials were looking into an AP request for information on the case. Saberi was Miss North Dakota in 1997 and was among 10 finalists in the Miss America pageant that year. The beauty queen graduated from Concordia College in Moorhead, Minn., with degrees in mass communication and French and with dreams of being an international correspondent. Now, Saberi is a freelance journalist who has reported for National Public Radio and other media and has lived in Iran for six years. Human rights groups have repeatedly criticized Iran for arresting journalists and suppressing freedom of speech. The government has arrested several Iranian-Americans in the past few years, citing alleged attempts to overthrow its Islamic regime. The most high-profile case came in 2007, when Iran arrested four Iranian-Americans, including the academic Haleh Esfandiari. The four were imprisoned or had their passports confiscated for several months until they were released and allowed to return to the U.S.
Saberi's father said that in her last phone call, she told him she was arrested after buying a bottle of wine. "We asked others and they said, `There's no detention for that.' So that's kind of an excuse," he told the AP. Buying and selling alcohol is illegal in the Islamic republic. A few minutes after that call, she phoned her parents again and asked "Please don't do anything because they'll release me in two days," Reza Saberi said. He told reporters she had already been detained 10 days by that point. He said he does not know where his daughter is or what charges she faces. "It's been very tough," he told the AP on Sunday. NPR said Iran revoked Saberi's press credentials more than a year ago but apparently let her report short news stories. An NPR spokeswoman said Sunday the latest information they had on Saberi was in the stories on its Web site. Saberi's father said his daughter was finishing a book on Iran and had planned to return to the United States this year. The book is about the culture and the people of Iran, he said. She was hoping to finish it in the next couple of months and come home to have it published. Roxana Saberi was Miss North Dakota in 1997 and was among 10 finalists in the Miss America pageant that year. She graduated from Concordia College in Moorhead, Minn., with degrees in mass communication and French and with dreams of being an international correspondent. She said that her goal as Miss North Dakota was to encourage people to appreciate cultural differences. Saberi's mother, Akiko, is from Japan and her father is from Iran. Roxana was born in the United States and grew up in Fargo. Her father said she was determined to go to Iran. "I was very worried and I was reluctant for her to go," Reza Saberi said Sunday. "She was very persistent about it."